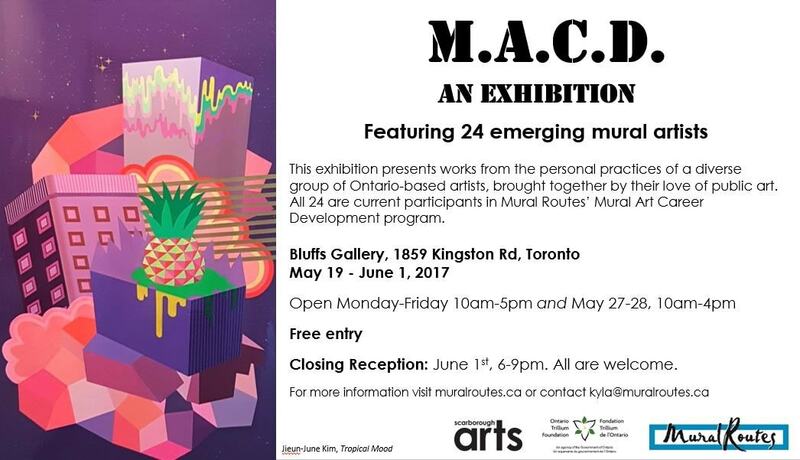 Visit the Bluffs Gallery May 18-June 1 to see artwork from the personal practices of the talented artists in the 2017 Mural Art Career Development (MACD) cohort. Mural Routes is so excited to share the work of this incredible group. These artists are already making their mark on the city and are working in the program to further develop their mural skills. Don’t miss your chance to see this exciting exhibition of smaller-scale work from their personal practice. Also open 10am-4pm during the weekend of May 27-28 for Doors Open Toronto, presented by Great Gulf. Visiting during Doors Open? Check out our free walking tour of nearby murals. Mural Art Career Development is a fully-subsidized, intensive program for emerging artists and project managers. The curriculum covers essential skills, from budgeting to community consultation, and allows for networking and placement opportunities. Entry into the program is through a competitive application process. The twenty-five artists and managers that make up the 2017 cohort have demonstrated their talent and commitment to mural art. This exhibition features work from the personal practices of these remarkable and diverse artists, all connected by their passion for large-scale public wall art. Mural Art Career Development is part of the Mural Art Learning Institute (MURALI), a continuum of training programs in all aspects of mural-making. MURALI is generously supported by the Ontario Trillium Foundation.